The biggest frame rate eaters in your flight simulator is your Level of Detail Radius, AutoGen, AI Traffic, Road/Ferries/Ship Traffic and Airport Vehicle Traffic. Funny enough, you can run any airport at Extreme Detail if you keep these settings in check! Why then do people always experience bad frame rates at large airports? Because there are more autogen scenery there. Now let’s look at the settings. The first one you will find is your Traffic Settings as indicated above. 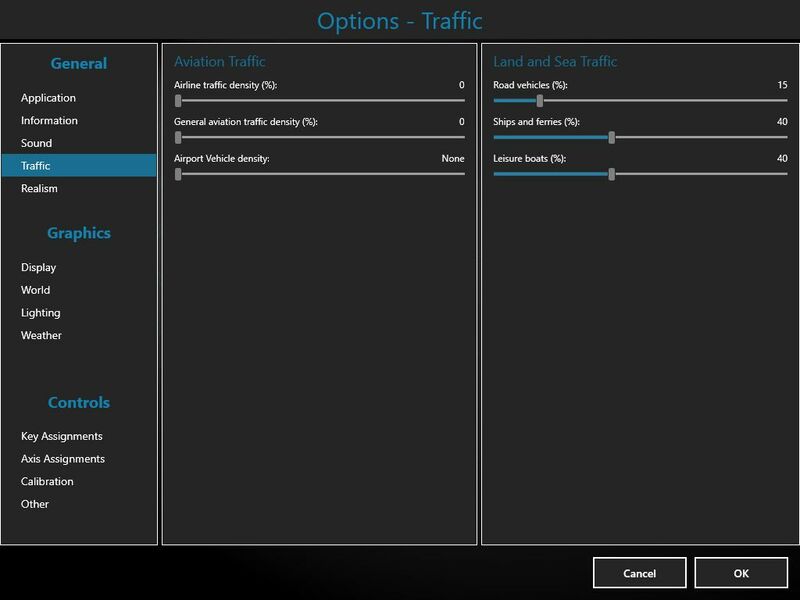 As a test, disable all the traffic such as Airlines, General Aviation and Airport Vehicle Traffic for now. We can come back and adjust that later. The setting for Road Vehicles should be low or else it will look like there is some mass exodus going on! A setting of 15-20% is usually good enough. Prepar3D sets the setting for ships and ferries at 40% as default. You can leave it at that or turn it off completely. It is your choice. The next setting is the one for display and what you set here will be dependent on the type of graphic card you have. You will find the Image and Texture Quality settings here with some nasty abbreviations unknown to the mere mortals like us! Let look at these abbreviations in more detail. FXAA stands for Fast Approximate Anti-Aliasing which makes jagged edges of rendered images appear smoother. You can choose to have this setting ON or OFF. Having it ON will decrease frame rate slightly, but it will make the picture you see look a lot better! The windows on the right has another setting called MSAA which stands for Multi-Sample Anti-Aliasing. This setting will improve image quality by blending the pixels from one image to the next, thus making texture changes look a lot smoother. A setting of 2X will be a good option to start with. Below you will find two more settings: Texture Filtering and Texture Resolution. Texture Filtering makes textures appear less blocky. Anisotropic filtering provides the highest quality of texture filtering, thereby yielding a crisper image. We are using a setting of Anisotropic X4, but you can adjust that to X2 if you like. The Texture Resolution setting is one of great debate! We all want large highly detailed textures, but we forget the impact it has on our graphics cards! A setting of 1024 is the best of you have a medium to good graphics card. You can adjust this setting if you find that your graphics card does not cope. The next setting is the one for world, which is also linked to the display. The Level of Detail Radius is an old one and since the days of Flight Simulator X it as been a source of unspeakable frame rate issues! A setting of MEDIUM is more than good enough for most hardware configurations. The next setting contains another one of those funny words and this one is the Tessellation Factor. Hardware Tessellation determines how hard you’re your graphics card processor will work to generate the scenery. Not all graphics cards have a Graphics Processor, so this setting may be unavailable to you. A setting of MEDIUM is good to start with. The next setting is for Mesh Resolution. Most mesh packages contain terrain mesh at a resolution of 76m. Setting this setting any higher will bleed off frame rate for no reason. Texture Resolution is another one of those debatable settings. Start with a setting of 1 or 2 meters to start with. Depending on your PC’s hardware configuration, you may come back and adjust this setting. 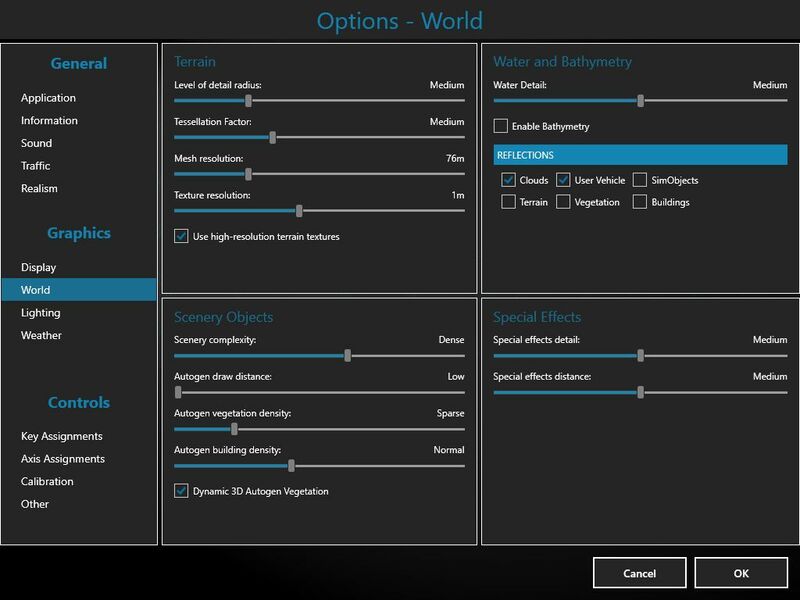 For Scenery Complexity, we recommend a setting of DENSE, but you can easily adjust this setting to EXTREMELY DENSE if you keep the other settings in check. 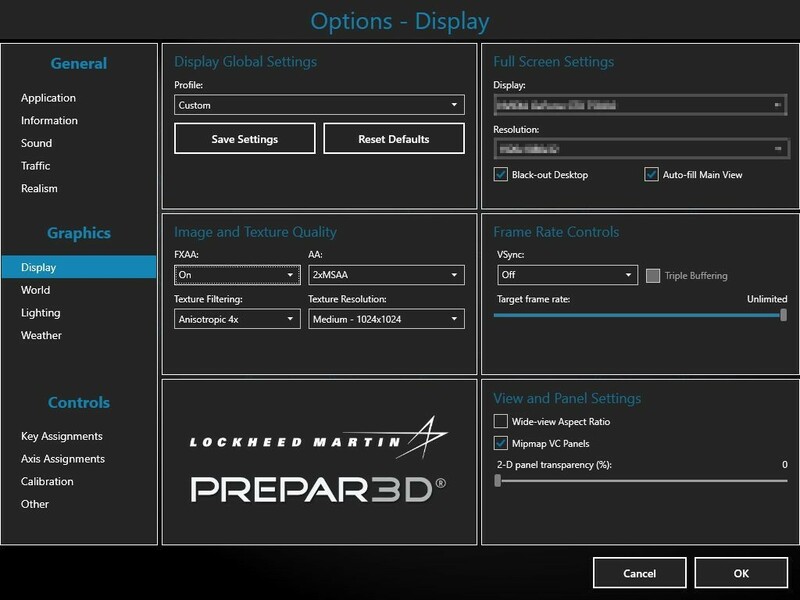 One of your biggest frame rate eaters in Prepar3D is the AutoGen setting, so be careful with this setting! It is one of the Number One reasons people get bad frame rates at large airports. None of us like flying with no autogen, so that is why we recommend the settings as in the image: AutoGen Draw Distance – LOW, AutoGen Vegetation Density – SPARSE, AutoGen Building Density – NORMAL. Unless you want to explore the world under the water, the setting for Bathymetry can be turned off. For your Flight Sim to generate the world under the sea while you are flying over it will just tax your processor with unnecessary calculations. Be careful what options you turn on for reflections. Too much can cause your Prepar3D to come grinding to a halt. The settings as in the image is good to start with. A setting for MEDIUM on Special effects is good to start with. Special effects include things like lights, steam vents, water features, etc. The taxiway lights we use at our airports are special effects too. There is no need to have these visible at 5 miles out! 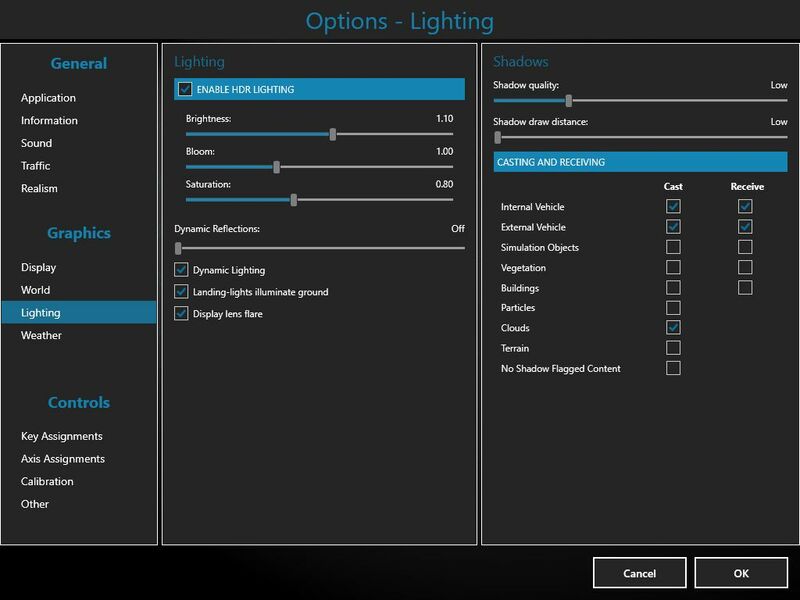 The next setting is the one for Lighting. You can pretty much leave it all as it was setup at default. The setting for Dynamic Lighting may be turned off. You may turn that on, but if the hit on frame rate is too much, then this should be turned off again. The setting to have your aircraft landing lights luminate the ground is a no brainer. No explanation needed! The option for Lens Flares is a nice-to-have. You can opt to have it on or off. When it comes to shadows, we all like them, but just like the AutoGen they EAT frames for breakfast! Actually Breakfast, Lunch and Dinner! We have set these settings very low, because we like the shadows, especially those generated by the clouds! Having part of the runway obscured in shadow during landing is really challenging! If these settings cause too much frame rate loss, then turn them off with the setting for Autogen first. The last next setting is the one for Weather. As before, we want detail, but not too much. You can pretty much leave everything at default here, but check the settings as we have it nevertheless. 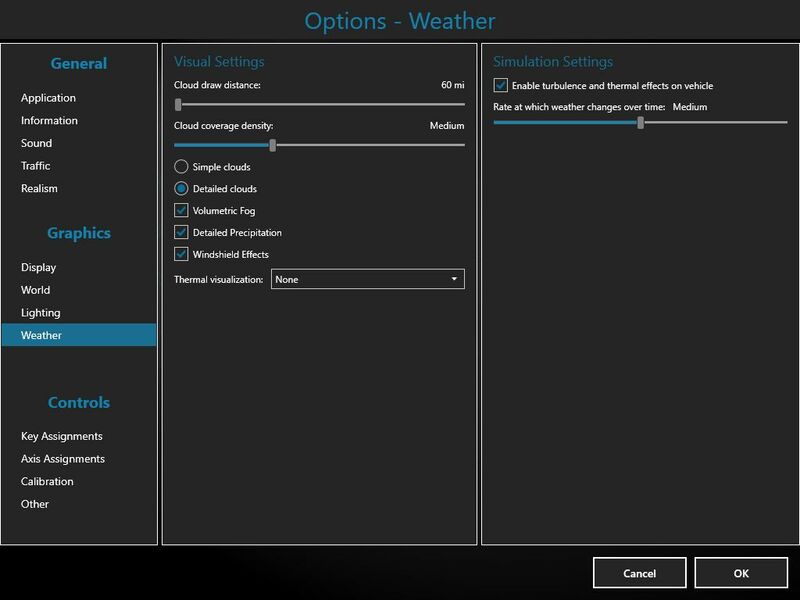 Setting the Cloud Draw Distance at the lowest setting will help your frame rates a lot without sacrificing too much. The other settings can be adjusted at will, but remember that the idea is too have detail, but not too much. Your aim should be to adjust your settings so much that you can run Prepar3D at 20-30 frames per second, day and night. Change what ever you need, using the above guide until you can accomplish that.